City of Renton Programs, Events, Fitness, and Fun for Everyone! 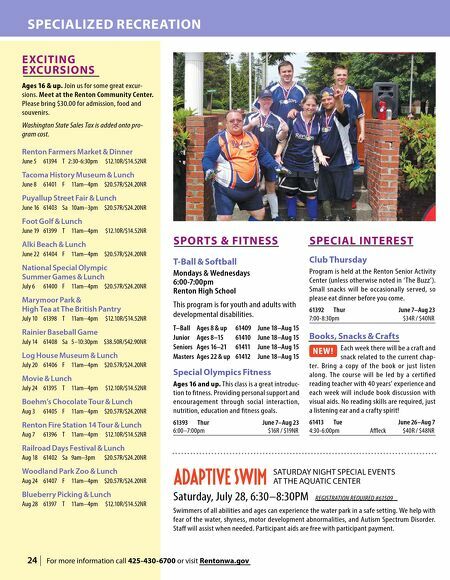 24 | For more information call 425-430-6700 or visit Rentonwa.gov SPECIALIZED RECREATION S P O R T S & FI T N E SS T-Ball & Softball Mondays & Wednesdays 6:00-7:00pm Renton High School This program is for youth and adults with developmental disabilities. T–Ball Ages 8 & up 61409 June 18–Aug 15 Junior Ages 8–15 61410 June 18–Aug 15 Seniors Ages 16–21 61411 June 18–Aug 15 Masters Ages 22 & up 61412 June 18–Aug 15 Special Olympics Fitness Ages 16 and up. This class is a great introduc- tion to fitness. Providing personal support and encouragement through social interac tion, nutrition, education and fitness goals. 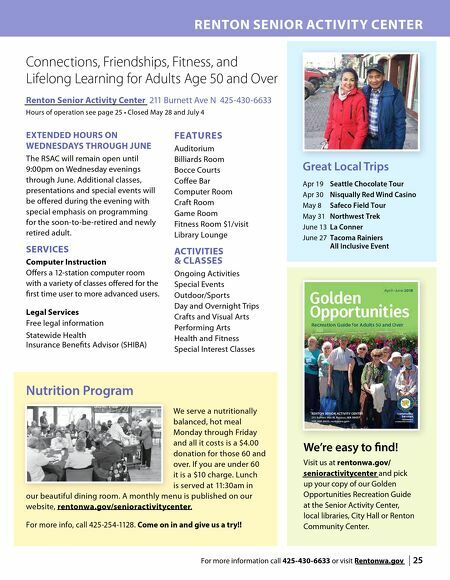 61393 Thur June 7–Aug 23 6:00–7:00pm $16R / $19NR S PE C IAL I N T E R E S T Club Thursday Program is held at the Renton Senior Activity Center (unless otherwise noted in 'The Buzz'). Small snacks will be occasionally served, so please eat dinner before you come. 61392 Thur June 7–Aug 23 7:00-8:30pm $34R / $40NR Books, Snacks & Crafts NEW! Each week there will be a craft and snack related to the current chap- ter. Bring a copy of the book or just listen along. The course will be led by a certified reading teacher with 40 years' experience and each week will include book discussion with visual aids. No reading skills are required, just a listening ear and a crafty spirit! 61413 Tue June 26–Aug 7 4:30-6:00pm Affleck $40R / $48NR E XC I T I N G E XCU R S I O N S Ages 16 & up. Join us for some great excur- sions. Meet at the Renton Community Center. Please bring $30.00 for admission, food and souvenirs. Washington State Sales Tax is added onto pro- gram cost. Renton Farmers Market & Dinner June 5 61394 T 2:30-6:30pm $12.10R/$14.52NR Tacoma History Museum & Lunch June 8 61401 F 11am–4pm $20.57R/$24.20NR Puyallup Street Fair & Lunch June 16 61403 Sa 10am–3pm $20.57R/$24.20NR Foot Golf & Lunch June 19 61399 T 11am–4pm $12.10R/$14.52NR Alki Beach & Lunch June 22 61404 F 11am–4pm $20.57R/$24.20NR National Special Olympic Summer Games & Lunch July 6 61400 F 11am–4pm $20.57R/$24.20NR Marymoor Park & High Tea at The British Pantry July 10 61398 T 11am–4pm $12.10R/$14.52NR Rainier Baseball Game July 14 61408 Sa 5–10:30pm $38.50R/$42.90NR Log House Museum & Lunch July 20 61406 F 11am–4pm $20.57R/$24.20NR Movie & Lunch July 24 61395 T 11am–4pm $12.10R/$14.52NR Boehm's Chocolate Tour & Lunch Aug 3 61405 F 11am–4pm $20.57R/$24.20NR Renton Fire Station 14 Tour & Lunch Aug 7 61396 T 11am–4pm $12.10R/$14.52NR Railroad Days Festival & Lunch Aug 18 61402 Sa 9am–3pm $20.57R/$24.20NR Woodland Park Zoo & Lunch Aug 24 61407 F 11am–4pm $20.57R/$24.20NR Blueberry Picking & Lunch Aug 28 61397 T 11am–4pm $12.10R/$14.52NR Adaptive Swim SATURDAY NIGHT SPECIAL EVENTS AT THE AQUATIC CENTER Saturday, July 28, 6:30–8:30PM REGISTRATION REQUIRED #61509 Swimmers of all abilities and ages can experience the water park in a safe setting. We help with fear of the water, shyness, motor development abnormalities, and Autism Spectrum Disorder. Staff will assist when needed. Participant aids are free with participant payment.